We are delighted to have secured ourselves a small supply of Brefu Bach, winner of Best New Cheese at the British Cheese Awards 2016. 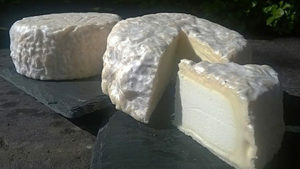 Brefu Bach, or Little Bleat, is a delicious ewe’s milk cheese made by Cosyn Cymru, a small producer in the foothills of Snowdonia. Made with vegetarian rennet derived from thistle extract, it reminds me a little of chèvre in appearance and texture, given its rind, but not in taste -it’s really gentle and creamy, with a slight sourness, and no “goatiness” at all. 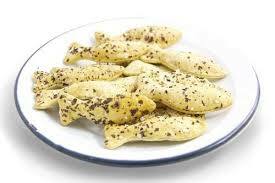 As well as cheese, we have also had another delivery of Welsh food and drink, including these little tiddlers from the Pembrokeshire Beach Food Company – fish-shaped crackers made with seaweed and Halen Môn sea salt. Great as something a bit different on a cheese platter.